The changing face of blogging? Thoughts from Blogworld Expo 2010. As I looked over the program, I had to admit that I wasn’t very impressed. There are tons of sessions at Blogworld, and they’re amazing for the right audience. 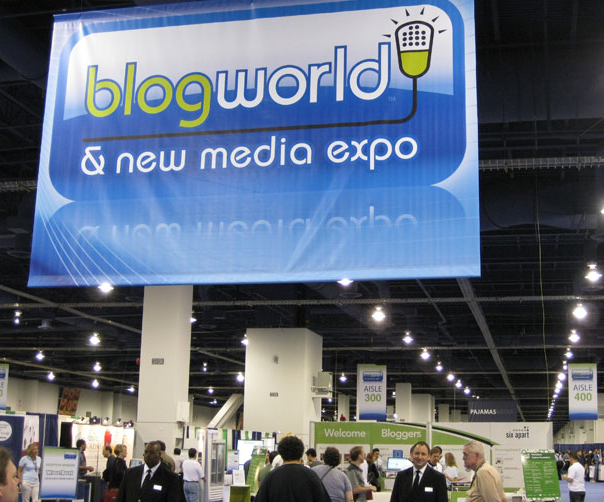 If you are a real estate agent, a mommy blogger, a beginning podcaster or any number of a thousand other types of bloggers, then you need to put Blogworld onto your radar as a must-attend event. The changing face of blogging, and the importance that it continues to gather, makes for a great conference with truly engaging speakers. But I don’t really fall into those definitions. I’m a blogger for a living. I find and write technology news. While I’m certain that there are things that I could learn from the sessions, they just didn’t really interest me. What I wanted to see was the expo floor, to get a feeling for not only what people are finding interesting, but also what it is that the businesses that surround blogging think is important today. The fact of it is, as many people have pointed out, you can monetize any blog if you spend the time to do it. But wait, isn’t blogging about passion and writing about the things that you really love? Well, yes. It certainly is. But why can’t you make a buck or two off of it as well? The face of blogging continues to change, and with it so do the options for rich media, advertising and monetization. Of course, as you add more media, that takes more resources, and there’s no lack of choices for managing the hosting side of your content, either. It wasn’t long ago that we (as bloggers on the whole) started embedding audio files, then video files came. From there we went to more in-depth, informative embeds. Whether it’s a PDF, a presentation or some other type of content, that content is king in setting your blog out from the crowd. Simply stated, it’s not enough anymore to just write about a subject. That market is too crowded. To stand out, you need to provide that something extra that people might not even be looking for. Judging by the floor of the expo, there are more businesses that are capitalizing on this trend as well. From platforms (the new features on Blogger.com are stunning) to sites such as BlogTalkRadio that are specializing in combining your blogging platform with podcasting, the field is open and huge. It’s no longer just a matter of sticking Google AdSense into your site. Now, as your traffic grows, there are options abounding. Whether it is a service that will allow you to cross promote with another site, or ones that will allow you to link keywords for only certain users, there is a world of options out there. More businesses are learning of the power of blogs, even the ones that are considered “small” by comparison. As they learn, and as they look for ways to capitalize on that, there are services all around the expo floor that are finding ways to introduce the advertiser to the blog and vice versa. Facing facts, there are choices far beyond anything any one person can summarize when it comes to blogging and platforms and advertising and all the rest. But the models continue to change on a daily basis. The ideas and platforms that inspire and empower us as bloggers are in a shift right now that is a welcome change. Is this what it comes down to, though? Are bloggers, and more importantly blog readers, ready for more signs of blogging as a real business? There’s no arguing that it’s already showing its chops for the money-making world, but at what cost? The other question, from us, is what you want to see. Is the introduction of more rich media and more in depth posting something that you love to read here on The Next Web? What could add to our content? Let us know in the comments, and feel free to link your own site if you’re proud of what you’re doing.